The DMA2D particularly is advantageous for managing displayed graphics. Two input pixel formats converters (PFC). These blocks are able to read and to decode the bitmaps files. The blender, which computes and mixes the data from the two input PFC. The ouput PFC, that decodes the information to be sent to the destination. The FIFOs used for both the inputs and the outputs connected to a specific DMA controller. Integrating blending, encoding and decoding functionality in the microcontroller itself, relieves these requirements from the application and the core that would otherwise be required for this. The STM32F429 contains up to 2MB of internal FLASH. In FLASH, a 320 x 240 pixel image requires a bit more than 75 K bytes when the colors are indexed in a 256-byte palette. Therefore, a few background images can be stored without problems. Storing bitmaps in FLASH is easy as long as there are not too many big pictures. But storing an editable object in RAM is more difficult to manage, since the size of the internal SRAM is always much smaller than the size of the internal FLASH. Instead of embedding a very large internal SRAM, the new STM32F429 features an internal controller for an external SDRAM. 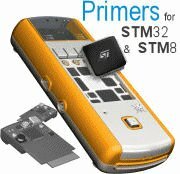 The STM32F429 EvoPrimer is equipped with 2Mb SDRAM, which can be used for large dynamic graphic objects. The CircleOS version for STM32F429 EvoPrimer/Open4 kepts an image of the screen in the SDRAM. This is because it is not convenient to address the RAM of the LCD on these hardware platforms. This image is sent (using the DMA) to the LCD when a DMA2D_ScreenRedraw has been executed. This mode allows management of several screen images in SDRAM, and performing of rapid switches between these screens. presentation slides about DMA-2D functionalities.